The long awaited widening of the Belagavi to Goa via Khanapur would commence soon as the NHAI has awarded the tenders to two firms for Phase 1 and Phase 2. Both will have one toll plaza. 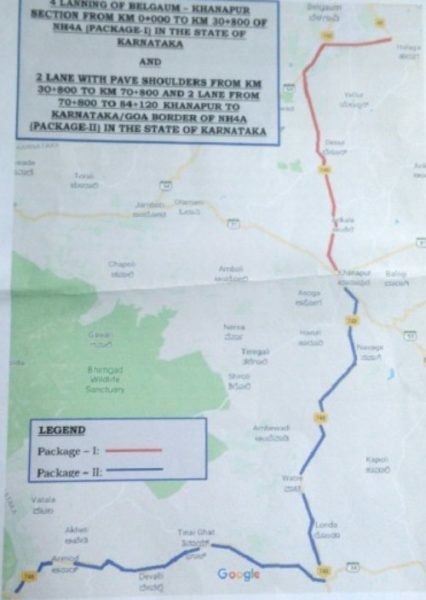 4 Laning of Belagavi-Khanapur Section (Km 0.000-Km 30.800) (Design Chainage Km 0.000 to Km 30.000) of NH-4A in the State of Karnataka on Hybrid Annuity Mode(Package I) has been awarded to M/s Ashoka Concessions Ltd.
2 Laning with paved shoulder from 30+800 to 70+800 km and 2 laning without paved shoulder from 70+800 to Karnataka/Goa border 84+120 Km has been awarded to M/s Dilip Buildcon Ltd.
BELGAUM smart city everywhere road widening but corporation and cantonment forget to main road in the belgaum SANCHAYNI CIRCLE TO FISH MARKET CAMP ROAD widened first. all the way from globe to Petrol pump is very small road on both sides of the divider. Its a traffic hazard. they are making road in street area but they forget main road in the belgaum where traffic are more, I think because of political pressure. ramlingkhind galli, ramdev gali, very small small area where they are made master plan but y they are forget this road????? actual the road is required 120 feet because of current traffic in this road. but are political leaders are busy in collecting votes. work started from fish market to gogte circle but what about from fish market to sanchayni circle ???? the total cost of gogte circle to sanchayni circle is about 12.5 cr but Karnataka government has passed only 1.5 cr epx. they passed but y they are not providing the money for sanchayni circle to fish market road. actually machhe halga bypass ring road not required fist they have to make 120 ft road from dharmveer sambhaji circle to gogte circle on top urgent basis…………………..